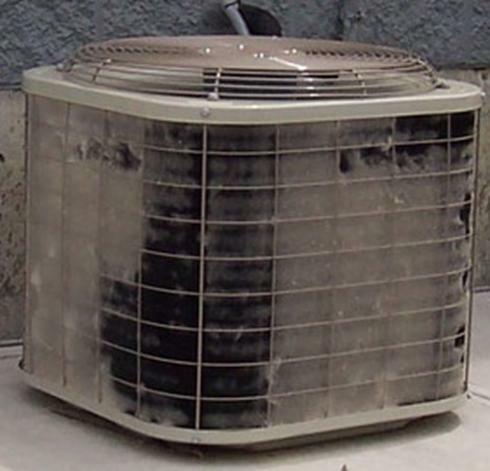 The majority of cooling coils lie unprotected from airborne particulate. Cooling coil air intakes are most commonly found on HVAC chillers, condensers, dry air coolers and in your local supermarket at the bottom of the refrigerated display cabinet. Cooling coils rely upon the passage of air across the fins to enable the refrigeration system to dissipate heat. If the cooling coil fins are clogged then this acts as a thermal insulator, the refrigerant is not cooled and there is a potential for damage resulting in unnecessary expense. The design of the equipment does not include air intake screen protection or cooling coil filters. Until recently there was not an efficient system able to cope with the many different styles of coil. The coil is based around standard modules but the coil filter is easy to adapt for any application. The cooling coil filter needs to be adaptable, supplied with many fixing options and allow maximum air flow with high arrestance efficiency. That means an air intake filter specifically engineered to cope with HVAC demands. The answer to that brief is now available, as all cooling coils can be protected by air intake filter screens for cooling coil filters. Simple to use, easy to install and incredibly efficient this product is now saving money on energy, maintenance and cleaning as well as protecting valuable cooling coil assets. Air intake screens for cooling coil filters are available from RAB Specialist Engineers Limited. Please contact us for further information.